Audi is offering between £2,000 and £8,000 under The Audi Scrappage Incentive. To get this , you must have a trade-in vehicle, of any marque, which is rated Euro4 or lower and first registered on or before 31 December 2009. The offer is not available in conjunction with any other offers, including finance offers. Your new Audi must be ordered by 31 December 2017 and registered by 31 March 2018. Cars traded in will be dismantled and recycled. The Scrappage Incentive is available on a selection of Audi models excluding the A8, Q7 TDI, R8 and RS. 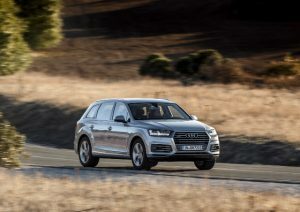 The Q7 e-tron qualifies for £8,000 Audi Scrappage Incentive.